Dustbot ® 5409; SO-G ® was the first robot to feature a built-in vacuum cleaner. Dustbot’s large eyes flash red and his arms move creating a sweeping action for the broom while his vacuum functions. He really vacuums; he picks up small pieces of paper, dust, crumbs, etc.. He senses any edge and turns away, for he is the robot with a brain, that vacuums. I don’t remember how or when I got that robot and I only vaguely remember playing with it. It was about the same size as Googie and I think I may have taken it apart at some point…?… What I do remember clearly though, was that the box it came in had photos on the back of the other robots in the product line, including the top-of-the-line Omnibot 2000. Daniel, what do you want for dinner? Nothing. 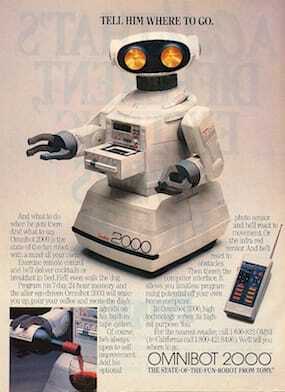 I want Omnibot 2000. Daniel, do you want to go to Bullwinkle’s for your birthday? No. 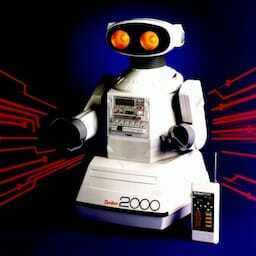 I want Omnibot 2000. Daniel, come watch The Muppet Show on TV! No, I want Omnibot 2000. Wow! Sometimes I wonder what things would have been like if I actually got one of these as a kid. Maybe I would have become more interested in robotics or computers and eventually pursued a career in IT? Or maybe I would have ruined it within the first couple of days trying to program it to pour me a glass of juice? Sure, it came with a detachable serving tray and supposedly you could program its arm to get you a drink from the fridge, but I remember the feature I was most excited about was the cassette deck. Not only could you use it to pre-record commands, but it also played back regular music tapes too… And if that wasn’t enough, it even had a built-in alarm clock! Tomy ® has created many toy robots throughout the years and in the 80’s created a line of small personal robots. They don’t have a true onboard programmable computer but are fun nonetheless. 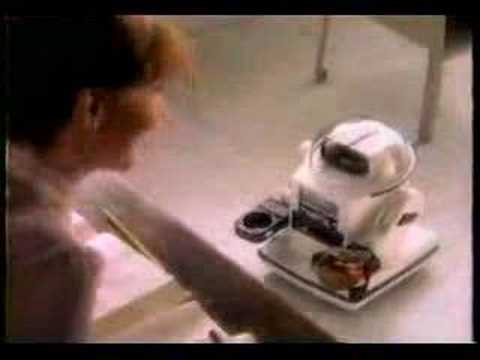 The top of the line was the Omnibot which could pour drinks on a special serving tray. The programming is done by recording the movement commands to a regular cassette tape which can be played back at certain times by using the built-in clock. Remote Features: The Master Control Unit (MCU) has an antenna with its power switch & indicator. It has a button to push in to talk through its microphone to the robot in which the robot will respond with eyes flickering. It has all the buttons to control the robot as follows: LEFT side of remote has arm up/down, wrist left/right, finger open/clamp, head right/left; RIGHT side of remote controls movement of robot to go forward/reverse, left/right turn, then the gear change in speed; also buttons for tape start/stop, Omnibot sounds, light on/off key. What? The original price was $600!? To put things into perspective, back in 1988 the minimum wage in Alberta was $4.50/hour (up from $3.80 the previous year) and $4.75/hour in Ontario (up from $4.55 in 1987). 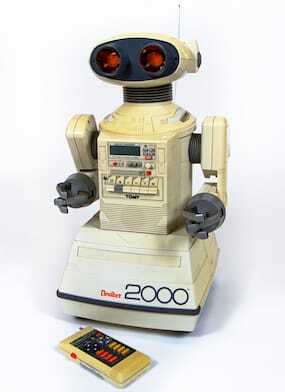 that’s about half of what it is now, so Omnibot 2000 was roughly $1200 in today’s dollars. Crazy! No wonder I never got one. 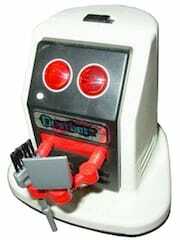 Nowadays you can still find working Omnibot 2000’s for sale online. I saw one listed on eBay the other day – it was barely used and in mint condition, apparently found in an attic in the original box complete with manuals, packaging and accessories – going for about $300 with only a couple hours left in the auction. Hm. Omnibot 2000 was published on Tuesday, October 23, 2012 at 7:15pm EDT by Daniel Menjívar and last updated on April 11, 2018 at 9:30pm UTC .